Jesus led them out of the city as far as Bethany, where he raised his hands and blessed them. As he was blessing them, he departed from them and was taken up into heaven. What are we to do with this account of Jesus going up to heaven? 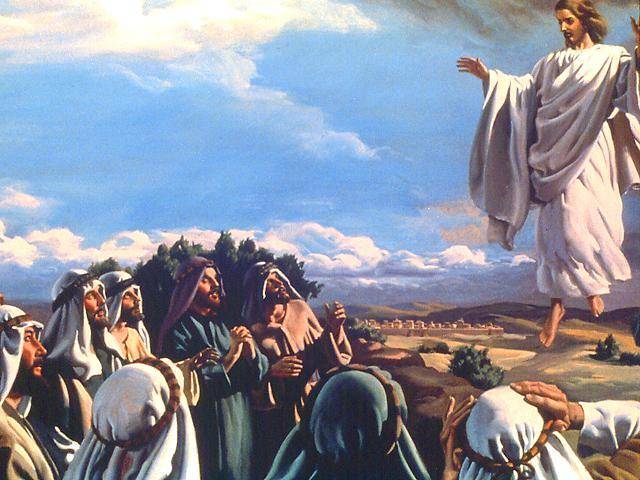 Jesus gives his last instructions to his disciples and then mysteriously lifts off from the ground and is taken higher and higher into the air. His disciples watch stunned and amazed. They continue to stare until Jesus is hidden from sight by a cloud. He is gone. To our 21st century minds this is edging toward science fiction, the highly unlikely, the hard to grasp and it’s better not to focus on it too much. When we think of people who can “take off” Superman comes to mind, or Peter Pan, or the famous words “Beam me up Scotty” from the science fiction Star Trek series, or other fictional characters. No-one in real life can just lift off and disappear into the sky and never come down again. For the early Christians, the ascension of Jesus into heaven was no problem and was widely celebrated. Some of the earliest celebrations of the ascension were held in Bethlehem – in the cave where it is believed Jesus was born. For them the ascension was the high point of what God had come to earth to achieve. God came from heaven and was born in Bethlehem, he died, he rose again to save all people, and then 40 days after Easter he returned to heaven to resume his heavenly throne. The early Christians had no problem in recognising that Jesus was God and that after his humiliation and suffering to accomplish forgiveness and salvation, the grand conclusion to his work was to be seated at the right side of the Father in heaven. As Paul says, “Christ rules there above all heavenly rulers, authorities, powers, and lords; he has a title superior to all titles of authority in this world and in the next” (Ephesians 1:21). The problem that the people of the first 3 or 4 centuries had was that they found it hard to accept that Jesus was a man, a human, the same as you and I and that he was both divine and human at the same time. Councils met and creeds were formulated to make this clear. For the early Christians the ascension meant that Jesus went up so that he could be the ruler of the universe and that included earth and especially the church. For people in that time heaven and earth weren’t totally separate places. There was a crossing over of the heavenly and earthly – it was the way people thought about God and the gods of the world religions of that time (e.g. Greek mythology). Our thinking in the 21st century is quite different. We have a distinct separation of heaven and earth. Many people separate Jesus’ humanity from his divinity (that is, if they think of him being divine at all) and so there is a talk a lot about what kind of a man he is – compassionate, kind, accepting, friendly, gracious and talk about how he interacted with other people. There is a lot of talk about him being a companion and friend and the earthiness of Jesus, but the divinity of Jesus – that he is God and rules over all things, that all things and all people are subject to him – that is a subject that most people outside the church think is all a bit too weird. Just as the early Christians had difficulty talking to the culture they lived in about the humanity of Jesus, we have difficulty talking about the divinity of Jesus to the culture in which we live. What are we to make of Jesus going up into the sky? Jesus who is such a good guy with so much to offer the world goes “up”, “ascends” – he leaves. A bunch of his followers are left behind to carry on but it’s not the same as having the one and only Jesus here. To the world which has no appreciation of the divine, this going “up”, this leaving makes no sense at all. So back to my original question – what are we to do with this account of Jesus going up to heaven? Jesus going up and away seems so contradictory to his final words recorded by Matthew, “I will be with you always to the end of the age”. Firstly, we need to get it out of our head that where Jesus went is a completely different faraway place. The New Testament writers tell us that Jesus’ ascension ushered in a new age that will end when Jesus comes again. It’s hard to find the right words to describe what this means. There is an element of mystery about it and is difficult to explain in a few sentences but here goes. In this new age, the old has not yet completely disappeared and new has not completely come. It is a time when heaven and earth cross over. Those who have died “in Christ” are in the heavenly world and those living “in Christ” now on this earth can also share in the blessings of the heavenly realm. Paul says, “In our union with Christ Jesus, he raised us up with him to rule with him in the heavenly world” (Ephesians 2:6). Right now in this life, through God's abundant grace, the Christian is not only raised with Christ to eternal life, but is also seated with Christ “in the heavenly world”. In a mysterious way the heavenly world intersects, overlaps, underlays, interleaves our earthly. We are already citizens of the heavenly world. So on the day when Jesus ascended to heaven, he wasn’t going away at all. He was entering a new dimension of his existence so that he could be with every one of us at the same time no matter what part of the world we might be travelling or what kind of dangers we might be experiencing. There is another part of the ascension of Jesus that is mostly lost to the 21st century thinking and that is when Jesus ascended to heaven he was covered with a cloud. To the early Christians this would have been a powerful picture. In the Bible a cloud often represents the holy, intimate presence of God. Jesus being surrounded by a cloud indicated that Jesus was entering the eternal presence of God. He and God are one and the same. He is seated at the right side of the heavenly throne. He has all the authority and the power of the divine and at the same time rules with meekness, peace, love, humility and strength. Jesus is God and is available to all people, at all times, and in all places. Yes, he can be with every one of us always even to the end of the age. Jesus going “up” to heaven doesn’t mean that he is watching us from afar; uninvolved in what is happening in our lives and perhaps getting involved only when he feels inclined to do so. “Up” in the ascension story doesn’t mean far away or absent or disconnected with what is happening in our lives. He has entered the heavenly world that intersects with our lives since we have been joined to Christ’s death and resurrection and has raised us up with him. What does Christ’s ascension mean for you today? Jesus invites you to trust him and you have every reason to accept that invitation. His love for you is totally reliable. His help in times of trouble is guaranteed. His comfort in times of grief and anxiety is unfailing. His forgiveness for guilt stricken consciences is never failing. His presence and strength when everything is getting too much and all too heavy is a certainty. His ear is always ready to listen to our prayers. Tragedies will happen to you and those you love. People will trick you and take you down. There will be those who will misjudge your compassion for weakness; use you and treat you as a sucker. There will be times of sickness and grief. But your Saviour will be there for you and with you. He has the power and authority over all things and even though you might like things to turn out differently to the way you have prayed, be certain that you can trust his love. Jesus is the King of kings and Lord of lords and the supreme ruler over the universe but he is still the one who comes to us in the simple bread and wine of Holy Communion. He still comes and gives us his body and blood and as we do that, we have a sense of the intersecting of the heavenly world with our lives. We have in our hands the body and blood of the supreme ruler of the universe who becomes part of us and we are joined to him as we eat and drink. In his body and blood we are reminded that his power is available to us at any time. And as Paul says, “There is nothing in all creation that will ever be able to separate us from the love of God which is ours through Christ Jesus our Lord” Romans 8:39). The ascended Jesus is closer to each of us than we realise. He will never let us down and especially on that day when we take our final breath he will take us from here to the heavenly realm where we join all those who have gone before us. In the meantime he has given us, his church, a job. He says, “Be my witnesses”. Tell one and all to trust Jesus, to love and follow him so that all may come to know Christ and be raised with him to rule with him in the heavenly world (Ephesians 2:6). Jesus is our living Lord who makes a difference in our lives and empowers us to make a difference in the world.